I had “one of those mornings” today. The kind that make you stress, angst and basically question if you are making the right decisions. I was deep in thought driving to work on a busy highway, when something caught my eye. Sitting high in one of the trees that lined the car-filled street, was a large, stunning bald eagle. I don’t think I’ve ever seen one that wasn’t sitting in a zoo or displayed in HD on a flat screen- and here was one right above my car. I drove ever so slowly so I could have a look at this very beautiful creature. What struck me about the eagle was his majestic presence and the sense of calm he seemed to exude. He was looking carefully at his surroundings, but he wasn’t phased by the noise, cars or mayhem that was just below him. He sat very still and took in the world around him. It was an amazing site. The strange part was, that just seeing this regal animal immediately made me feel calm. It was as if the eagle’s presence had swept over me and reminded me that a higher power was watching over me that very instant- when I really needed it. 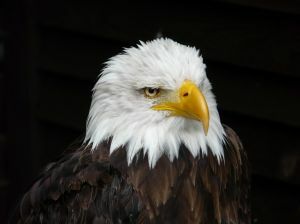 The eagle was a powerful reminder that we can experience our hectic surroundings without letting them rattle us. If you are feeling overwhelmed today by tough circumstances, sadness or grief- sit still, take a deep breath and invite calm to sweep over you. Be like the eagle.